Once you sign in, you will see the My Halloo summary page for your extension. 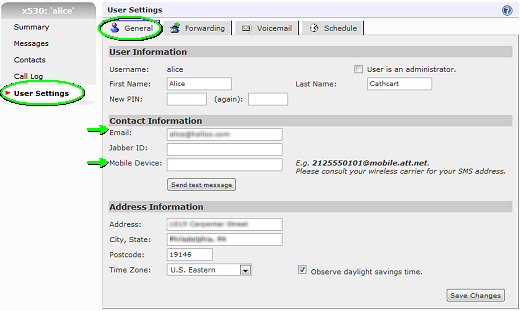 This gives you a quick overview of your personal extension, including voicemail status and call forwarding preferences. You can explore the details of your extension by clicking on the tabs along the left. From here you may review your voice messages, manage your address book, view your call log, and much more. 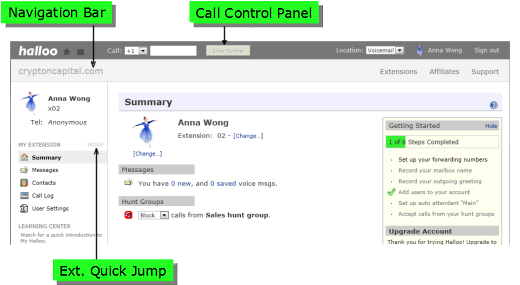 Along the top of every My Halloo page is the Call Control Panel. This area allows you to place outbound calls using Halloo, set your outbound Caller-ID and adjust your current forwarding location. Note that the control panel will reflect the settings of the signed-in user. If you are an administrator and are configuring a different extension, the forwarding and caller-id settings in the control panel do not affect the other extension. If you are set up as an administrator of your account, you will see an expanded Navigation Bar, which will give you access to system wide options. You have the power to to create new extensions, order new services, and see the settings for all extensions in your account. To access these areas click on the All Extensions and My Account links in the Navigation Bar. For administrators, the Extension Quick Jump menu gives you quick access to other extensions in your plan. For example, Ext-00 is usually your auto attendant, and Ext-01 is usually the administrator extension. Click on the User Settings tab to access your general preferences. To change your PIN enter your New PIN into the form and click Save Changes.